1. Preheat the oven to 190 degrees c / Gas mark 5. 2. Wipe the mushrooms clean with damp kitchen paper and remove and chop the stalks finely. 4. Add 1 tbsp of the butter to the onion mixture along with the breadcrumbs, dried herbs and salt and pepper to taste. 6. Remove the skins from the sausages and add the sausage meat to the breadcrumb mixture. 7. Mix the remaining 1 tbsp of butter with the crushed garlic and add this to the sausage filling. 8. Lightly brush the undersides of the mushrooms with the remaining 1 tbsp of olive oil, season them with salt & pepper and place them on a lightly oiled baking tray. 9. 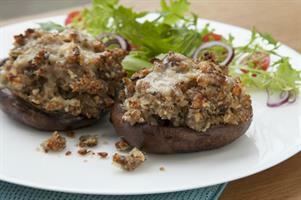 Spoon the sausage mixture evenly onto the mushrooms and bake in the preheated oven for 20 minutes.